Garage doors operate thanks to the track and rollers, whether you have an automatic opener or you open and close the door manually. Because you use your door at least once a day and often more, the rollers and tracks need maintenance and inspection. Taking care of them on a regular basis should help prevent any major issues from occurring. To start, remove all your vehicles from the garage and close the door. Use a ladder to inspect the tracks and ensure they are clean of debris. To clean the tracks, you can use an old toothbrush or other small brush to clean out the tracks and dislodge dirt, leaves or other debris, as well as any grease that has built up. Disc brake cleaner can be sprayed into the tracks to give them a thorough cleaning, and then wipe them out with a cloth. Tracks can also be checked to ensure they are aligned properly, as they should hang the same distance from the ceiling. 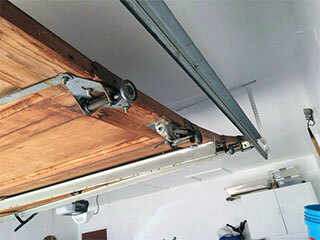 You can also use a level to ensure they slant from the opening of the garage towards the back wall. Rollers should also be checked regularly and if they’re worn, they will need to be replaced. If they are metal and they have unsealed bearings, the bearings should be cleaned of any dirt or built up grease, and then sprayed with silicone spray oil specifically for garage doors. If the rollers are nylon and have sealed bearings, they don’t require spraying with lubricant. In the case of both types of rollers, you can spray lubricant around the rollers. It’s also important to check all the nuts and bolts of the rollers, hinges and tracks to ensure they aren’t loose or worn. There are a number of things that can go wrong with tracks and rollers that you should watch for on a regular basis, as well as when you conduct an inspection. Listen for squeaking rollers, rollers that are crooked, or rollers that need to be replaced. Rollers can also slip out of the tracks. It’s important to contact a professional to handle repairs in these instances, as doors are under the tension of the cables and springs, and are extremely heavy. If you have problems with the tracks or rollers, you don't need to look far for the best repair specialists near your location. Contact the technicians at Garage Door Repair Miami and let professionals with over 10 years of experience handle everything.